Following this tutorial, you will learn how to use clear resin to give a beautiful high-gloss finish with a doming effect to many materials, including polymer clay, paper, wood, metal, and any painted surfaces. I use it extensively for my own polymer clay projects, and happy to report that this resin creates the smoothest and shiniest surface I ever saw on any polymer clay piece. The best thing is that it helps me to avoid laborious sanding, polishing, and buffing, which would have been required to reach similar results. Both EnviroTex Lite and ICE resins consist of two liquid parts, which have to be measured precisely, in equal amounts, and mixed immediately before use. While general instructions can be obtained from the manufacturer of these resins, they are more suitable for big projects and lead to lots of product waste when working on a small scale (such as covering pendants, focal beads, and other jewelry parts). This tutorial is a step-by-step demonstration of my own technique, which makes mixing and application of this type of resin much easier and minimizes the waste as well. I also included instructions for troubleshooting and correcting of the most common mistakes that may occur while working with these resins. this tutorial contains 10 pages and 16 pictures. These instructions are based on my experience with polymer clay, as I said earlier, but they can be successfully applied while working with any small and flat objects made of other materials. 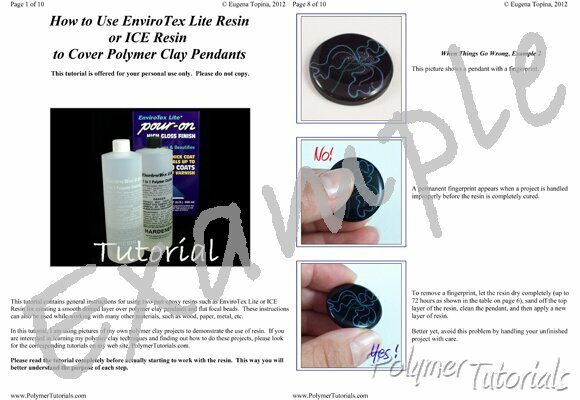 This is a supplemental tutorial to all my polymer clay and resin techniques and projects, and the last three pictures on this page show a few examples of such tutorials. Place a mouse over the small pictures to see them enlarged. Please follow this link to see a complete list of my polymer clay and resin projects: Polymer Clay and Resin Tutorials. Great tips, thanks Jenny (United Kingdom) ..